One of the coolest features any bonsai can have is deadwood. 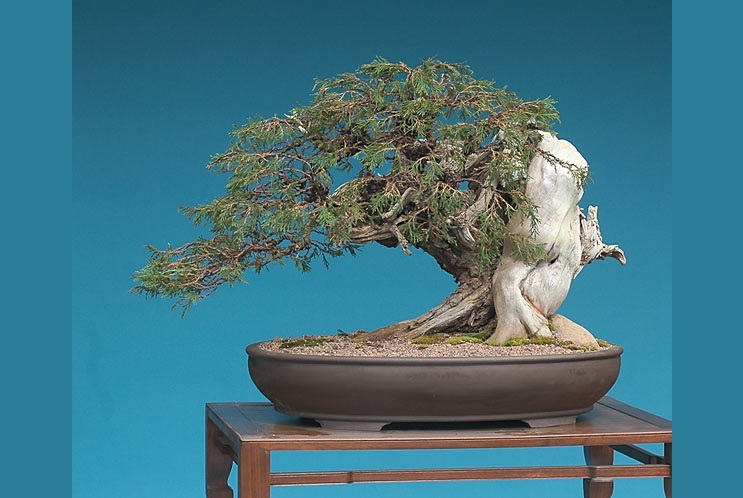 The deadwood technique enhances the illusion of age by creating, shaping and preserving deadwood on a living bonsai. This is used on branches or the top of the trunk to show that the tree has old age or has battled to survive. The Jin technique mimics natures attack on a tree through wind, lightning or any other adversity that usually kills the top ( or leader) of the tree and dries it out to form the jin. Although Jin may appear normal on the coniferous variety of bonsai, they really dont look natural on deciduous and most broadleaf species. This is because usually when the branches die on these species they rot and fall completely off. A small noticeable indentation is all that remains, while new wood growth forms around it creating a hollow. Bonsai artists replicate this by making small wounds in the trunk to avoid having a wound scar without control. In this technique the deadwood is actually the main trunk of the bonsai. Usually a wound exposes a dead part of the trunk, which is surrounded by living bark. If there is enough deadwood on the trunk, the bonsai is now considered a driftwood or Sharamiki style. This style is highlighted by “veins” of living bark connected to the branches that are still alive, but other than that, the majority of the wood around that is dead, stripped of bark and usually has a weathered look to it. The literal meaning of the word means either a hollowed or split trunk. The technique recreates the effect of a lightning strike or other severe trunk damage that trees suffer in nature. Usually bonsai artists achieve this by stripping the bark, then carving the exposed wood to create a deep wound. In this style a living bonsai tree is joined to an already preserved and treated deadwood to create something similar to the driftwood style. To do this style bonsai artists carve a groove into a deadwood and use a living tree is placed within the channel using nails, screws, wire wrappings or clamps. With enough time the tree grows into the groove, which makes it seem like it is growing from the actual deadwood. Once everything is in place, all the restraints are removed.